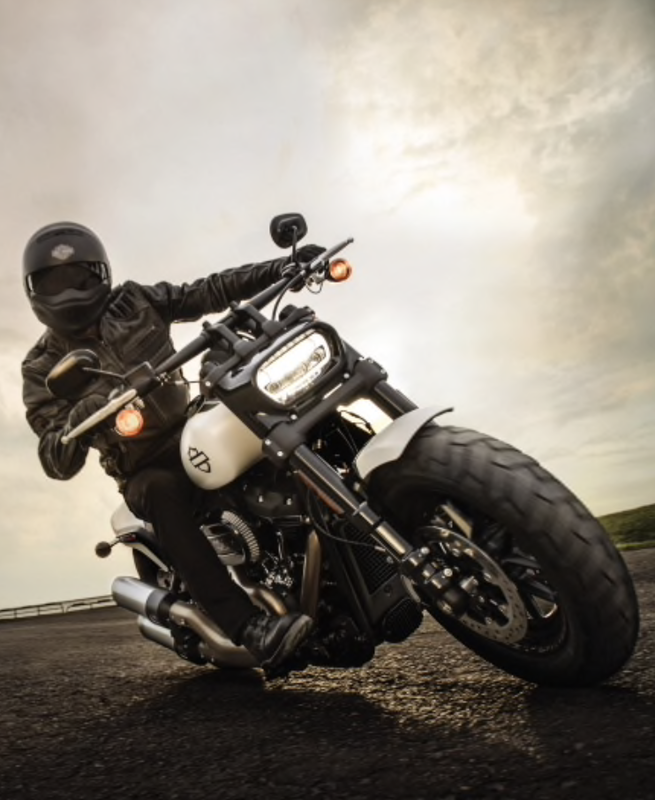 When is “new,” “all-new,” “brand new,” “built from the ground up new,” “the newest,” “newer and refreshed,” advertising claims of an existing or previous Harley-Davidson really new? Is there no objective basis by which to measure when a motorcycle is actually “new?” What do you think? 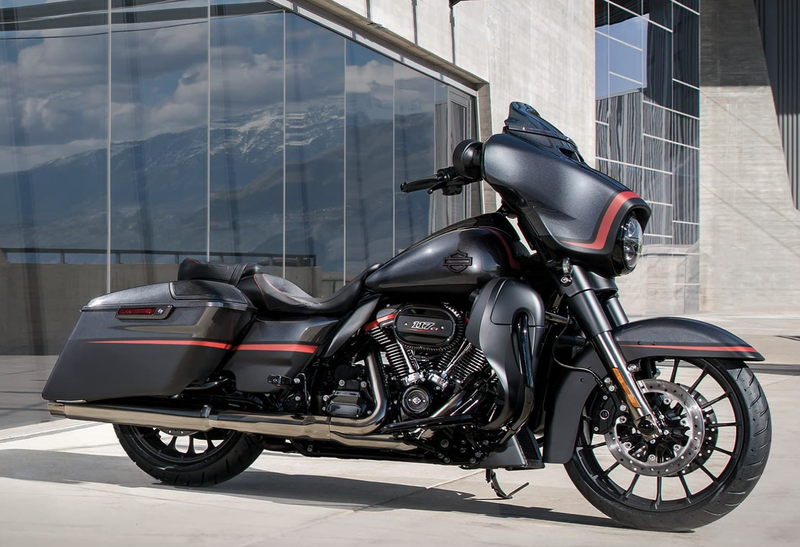 It’s been reported that motorcycle enthusiasts are holding on to their old, reliable wheels for longer stretches of time, but Harley-Davidson wants to change that and has rolled-out the “brand new” 2018 #FreedomMachine models. Dealer launch video is HERE. Send in the millennials and let’s make a deal! Or in other words, what the company is hopeful for after the ‘largest ever product development project’ was undertaken. They may not look very different, but the 2018 changes to the engine, frame and suspension over shadow any “new” colors, new handle bar position or new seat thread design. “All-new” is really what we’ve been promised to modernize these traditional bikes and it’s not a rehash of the old. 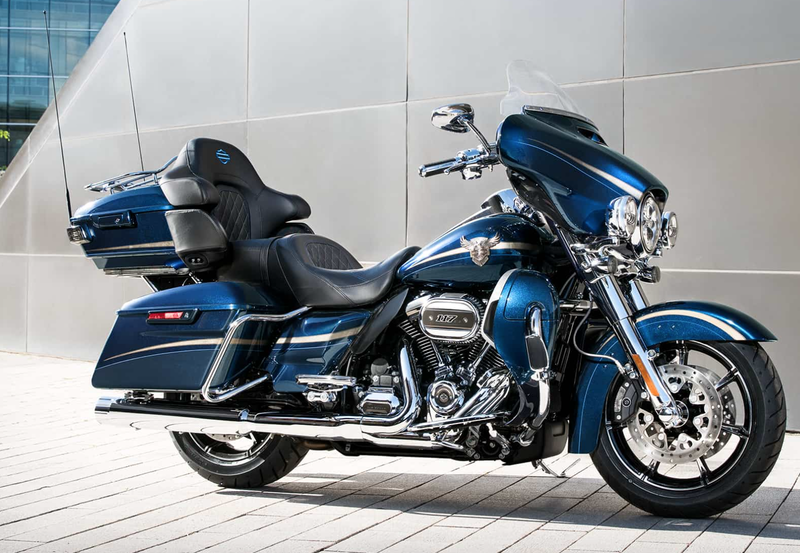 The quick read is that the Softail and Dyna product lines, as riders have known them previously, are gone. The Dyna family is discontinued and the Dyna nameplates are now Softails! That’s the provocative and on the 2018 model revamp, all of the models that used to be in the Dyna’s lineup — the Fat Bob, Low Rider and Street Bob — rolled into the Softail lineup — Softail Slim, Heritage Classic, Deluxe, Fat Boy and Breakout — Harley completely redesigned the Softail chassis. Not a minor cosmetic change, but a complete overhaul of the entire frame and suspension. 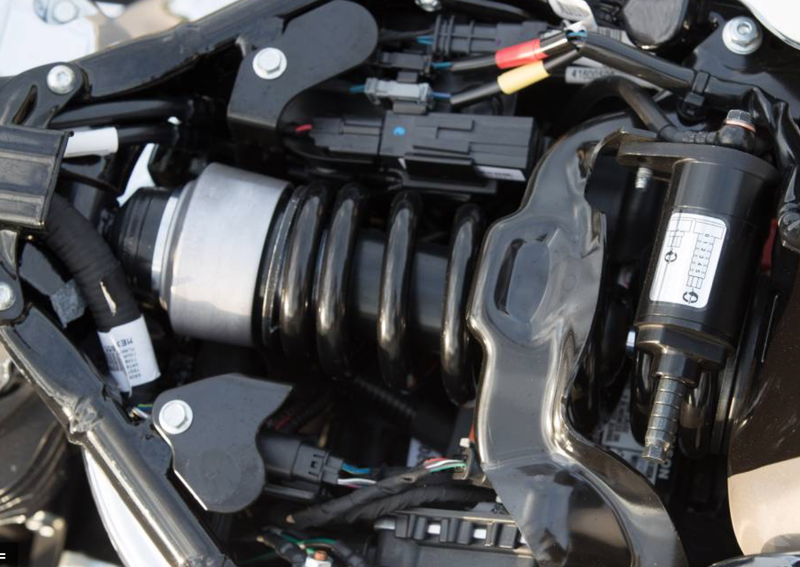 The new under-seat mono shock rear suspension aims to offer improved ride quality, traction, and control while the triangular swingarm maintains the classic lines of a hardtail frame. 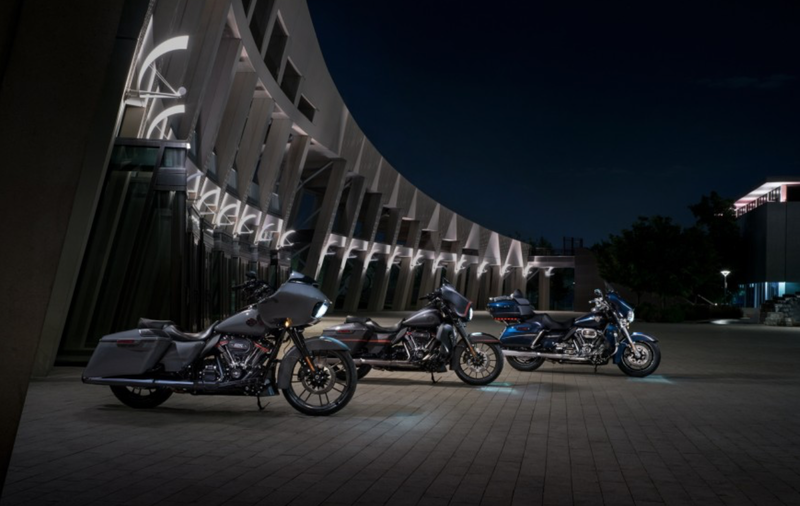 The revamp also includes key accommodations for last years release of the Milwaukee-Eight, the first four-valve-per-cylinder heads engine packaged into the classic 45-degree V-twin. From the styling department, all the new 2018 bikes have a much darker and aggressive paint scheme. It’s largely a brooding “protester” feel with colors matched and with a “masked” or blacked out engine. 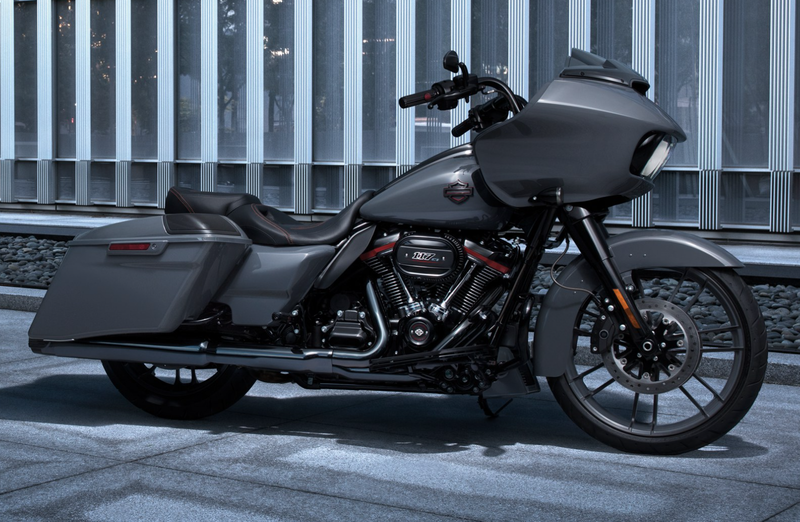 There are smaller changes to individual models such a color-coded inner fairings, new wheels (including a 21” one for the Road Glide) and different exhaust finishes. Oh and don’t forget that riders can now pair Bluetooth headsets with the stereo to remain wirelessly “connected” — on its top-of-the-line touring models. I’ll address the hype right here: Your motorcycle and your smartphone are starting to have a lot in common, though only one can be used to take a selfie — at least for now. 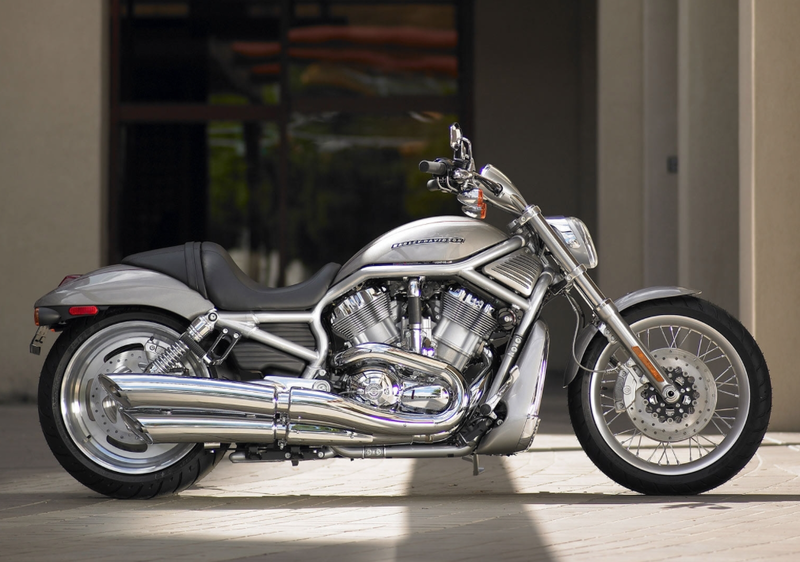 Lastly, the motor company announced the 115th Anniversary edition motorcycles. There will be two limited-edition, serialized designs with 115th Anniversary Eagle and special anniversary paints available on nine different models in 2018 to celebrate the birthday. In the social media and PR launch extravaganza for the 2018 line up earlier this week, Harley-Davidson quietly discontinued the V-Rod. The 2017 V-Rod Muscle and Night Rod Special are the final iterations of the VRSC (V-Twin Racing Street Custom) line. You may recall this motorcycle had the Revolution engine that was co-developed with Porsche and based on the VR-1000 Superbike that Harley used in competitive drag racing. It had a hydro formed tubular frame, a gas tank under the seat with round-topped airbox cover up front posing as a gas tank. This was often referred to as the Harley for the non-Harley motorcycle rider and was a testimony that engineers and the brand were capable of doing something very different. It was introduced in 2001 and discontinued 16-years later. Did Harley-Davidson Just Copy The Jeep “Freedom” Campaign? 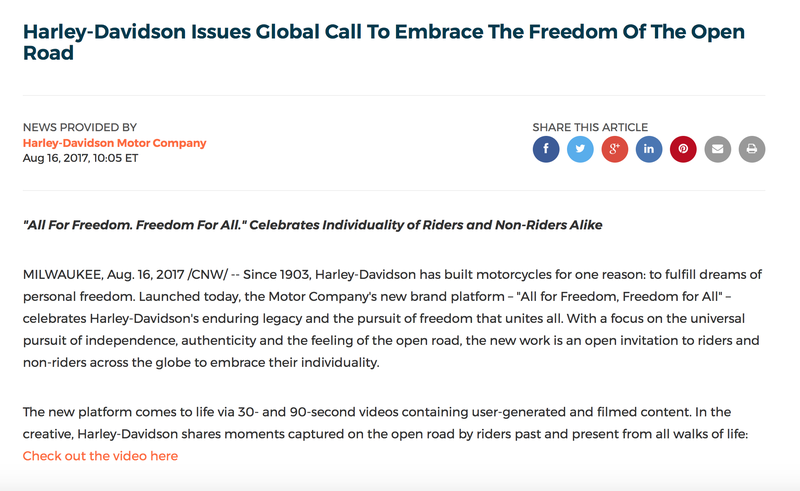 It’s part of a 10-year global strategy to build the next generation of Harley riders and the new brand platform is “All for Freedom, Freedom for All” which comes to life with videos containing user-generated and filmed content that shares moments of the open road by riders past and present. 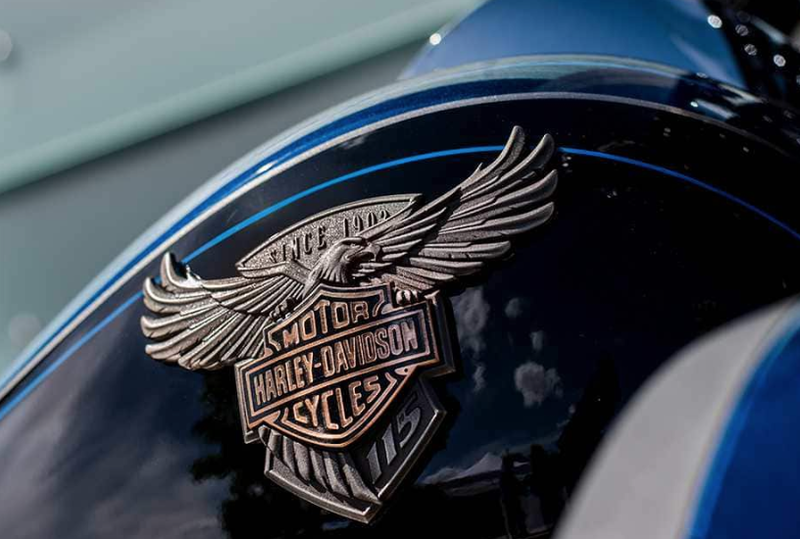 The ambitious campaign goal is to increase Harley’s brand relevance and inspire those “sleeping license holders” to experience the same freedom that all current Harley riders feel with the wind in the face and ultimately to purchase a motorcycle. The Harley-Davidson marketing group is using the #FindYourFreedom hashtag to generate social media awareness. It’s common knowledge that when using a hashtag, you are categorizing your post and is viewed as a valuable tool when marketing your brand. The objective of course would be to find a hashtag that has never been used previously and one that would really set the campaign apart from all the other social media noise. 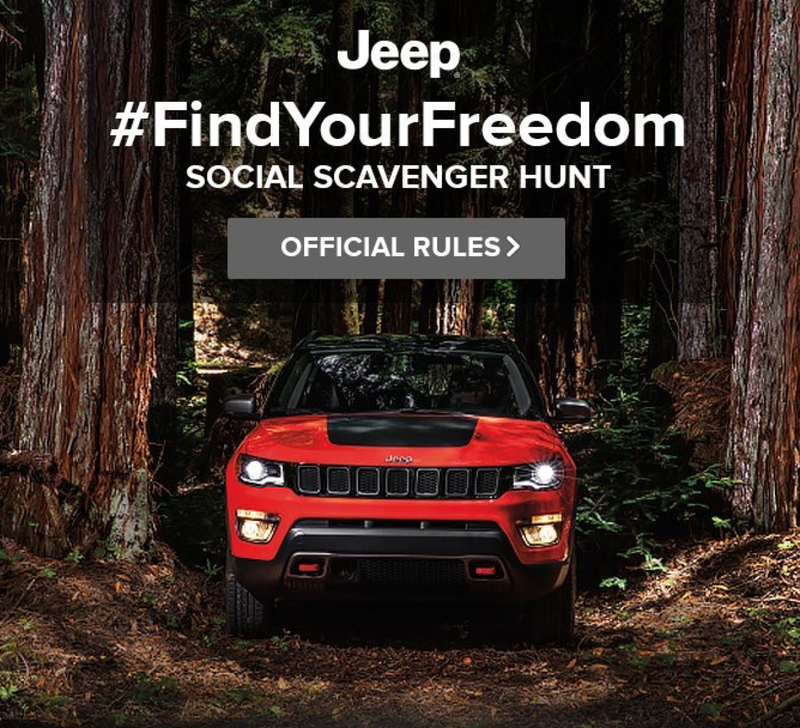 However, there is another large company with an equally large brand that is already using the #FindYourFreedom hashtag with an associated marketing campaign. They spell it: J E E P — you know, the company with an adventurous lifestyle that requires an adventurous vehicle! While you can’t legally own a hashtag, the marketing 101 manual suggests that you chose one that people will associate with your brand, by leveraging a distinctive phrase or word associated with your company and messaging that marketing execs would, at best, like to see go viral or, at worst, contribute to the marketing campaign in a very positive way. Think about it. Harley-Davidson just launched a multi-year campaign and is encouraging motorcycle fans to join the social media conversation of a larger Jeep fan base! The marketing folks may have actually “muddied” the Harley-Davidson brand or made it vulnerable by this hashtag gone wrong. Photos courtesy of Harley-Davidson and Jeep. It’s official. 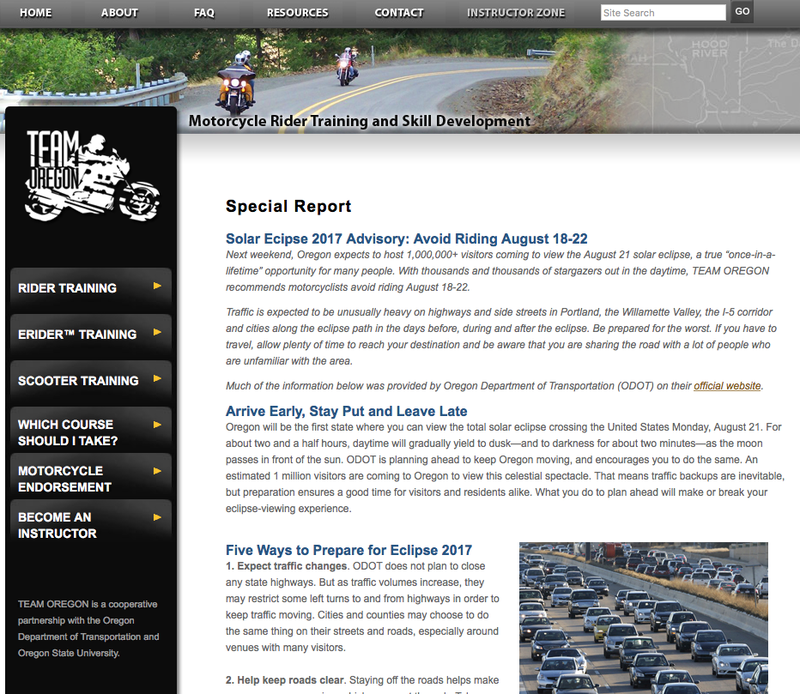 The Great American Solar Eclipse and the potential for catastrophic disaster has produced the first ever Oregon Motorcycle Solar Eclipse Advisory: AVOID RIDING MOTORCYCLES, August 18 — 22, 2017 is the stated recommendation. Plan to have a good time watching the 2-minute daylight-to-twilight event (around 10:15 am), but just don’t travel anywhere by motorcycle for 5-days! Huh? How did we get to this place? The “once-in-a-lifetime” excitement and buzz surrounding the eclipse is now at Defcon 1 with less than seven days before the interstellar event. For months people have been on an obsessive pursuit of the perfect photo location. Get outside advertisements and turn your Oregon journey into a legacy have been everywhere, Eclipse 101 brochures, guide pamphlets, and preparedness articles are in overdrive across all forms of media. But, there is this bazaar pre-cog of an impending apocalyptic doom that is permeating the eclipse narrative given that hundreds of thousand of people and their vehicles — perhaps millions — will converge on the already severely overcrowded highways. Can you spell Oregon anxiety and fear? Media ratings often drive the “never miss an opportunity to drum up catastrophic hysteria:” Did you set up a generator ‘war room’ in your basement in case of a state-wide breakdown of electricity and communication? Did you rent a satellite phone to update your social media channels from Steens Mountain? Does your family have an evacuation route and disaster preparedness plan? Did you stock up on SPAM and water? Do you have a full tank of gas? Did you buy extra coolant and oil for the engine? Do you have jumper cables? Did you purchase a spare tire for your spare tire in case it goes flat? Did you drain your checking account and now walking around with thousands of dollars in your wallet? Do you have paper maps in case the cell phone grid goes down? Did you take a first aid course? Do you have a roll of duct tape? Did you buy a package of souvenir: “The Path Of Totality” toilet paper? Seems silly, but maybe the media should ask us if we remembered to breath? 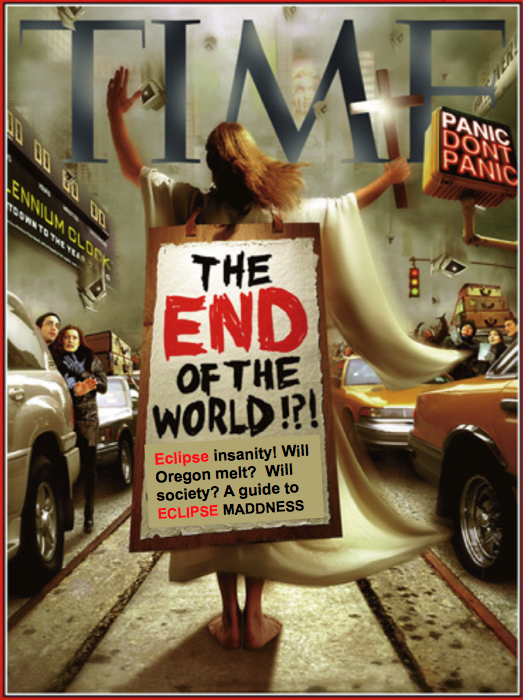 Is the sky truly falling or is the daily drum beat of “chicken little” prudent preparedness? I don’t think we want the celestial spectacle any darker and will know soon enough. Though we might make fun of them a little, looking back, we may also sympathize, but after a long season of eclipse anxiety and survival doomsaying, condensed with all the scientific history, phony viewing glasses and hype — we should all be so lucky as to have yet another boring Monday on August 21st. TIME photo modified by author with original courtesy of TIME. TEAM Oregon photo courtesy of web site. I’m a H.O.G. member, but not the type of person who displays an undying passion for the patches and pins or for that matter in attending a lot of H.O.G. events. Sure, I’ve participated in the occasional H.O.G. rally, got the t-shirt and then headed home. Riding is primarily a solo activity for me and it’s more about riding in the wind, not the rally destination. Although there was this one time in Hawaii where it was all about the food. The Aloha State Chapter #44 (Maui H.O.G.) were in the middle of a rally. I wasn’t riding a motorcycle on the islands, but they were most gracious and let me enjoy some excellent pulled pork at their Luau! We also had the opportunity to meet Cristine Sommer-Simmons, the book author of ‘Patrick Wants To Ride‘ fame. A riding buddy and I decided to register and took a couple weeks last month to ride along with the H.O.G. Lewis and Clark; The Expedition Returns posse. There were 182 register bikes for the tour which basically followed most of the same Lewis and Clark routes from Seaside, Oregon to St. Charles, Missouri. They deviated a bit on the eastern side of the Rocky Mountains which only added to the adventure. Before I jump in and provide some insights about the ride, I want to say that H.O.G. is a class act. 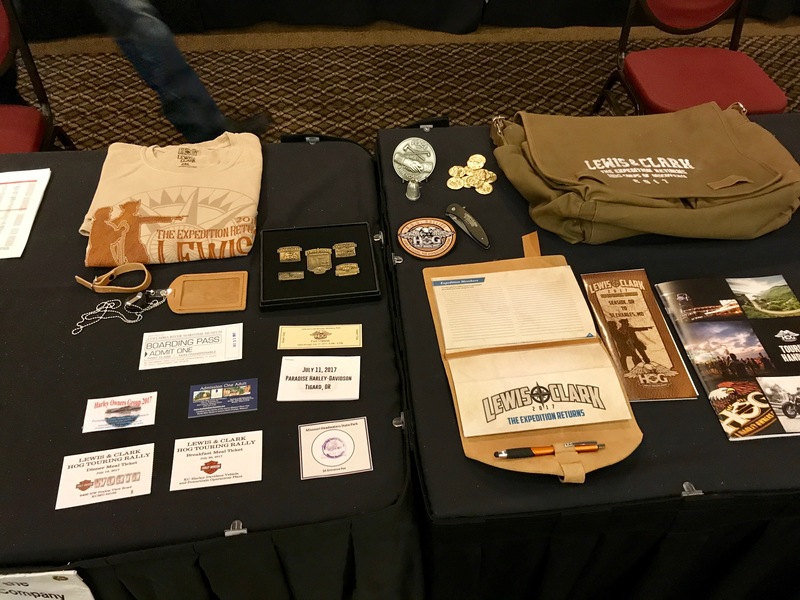 Yes, there was a pricey registration fee, but the swag and goody bag we received for the expedition was detailed, high quality and exceeded my expectations. The hotel registration process via the H.O.G. web site worked well and we had no issues in any location. Big shout-out to Harley-Davidson, Team MKE, Paul Raap (H.O.G. Regional Mgr), Paul Blotske (H.O.G. Contractor) and the H.O.G. planners for making it simple and a great experience! Now keep in mind this wasn’t a “group ride” where 182 bikes departed simultaneous every day with a ride captain. We were free to forge our own path (with some solid guidance) and ride with who we wanted and at our own pace. H.O.G. provided a travelogue with approximate mileage and points of interest along the way for each day’s schedule. In some cases they included passes for the various parks and/or sight seeing destinations. This process worked well. Day 1, (Tuesday, July 11) — Had us traveling to the Oregon coast to visit the Fort Clatsop National Historic Park where the Corps of Discovery wintered from 1805 to Spring 1806. After 18 months of exploring the West, the Corps of Discovery built an encampment near the mouth of the Columbia River. 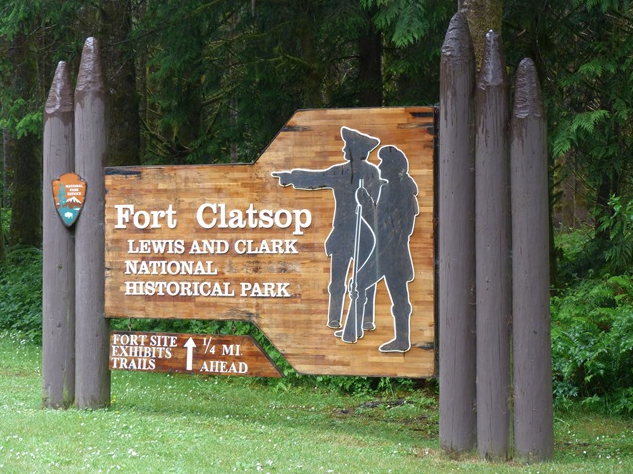 They wintered at Fort Clatsop into 1806 before leaving the Pacific Ocean to return to Missouri and the route we were going to follow. That evening Mike Durbin and Paradise Harley-Davidson (Tigard, OR) sponsored the gathering for dinner. Day 2, — We were traveling east and heading to Lewiston, ID. 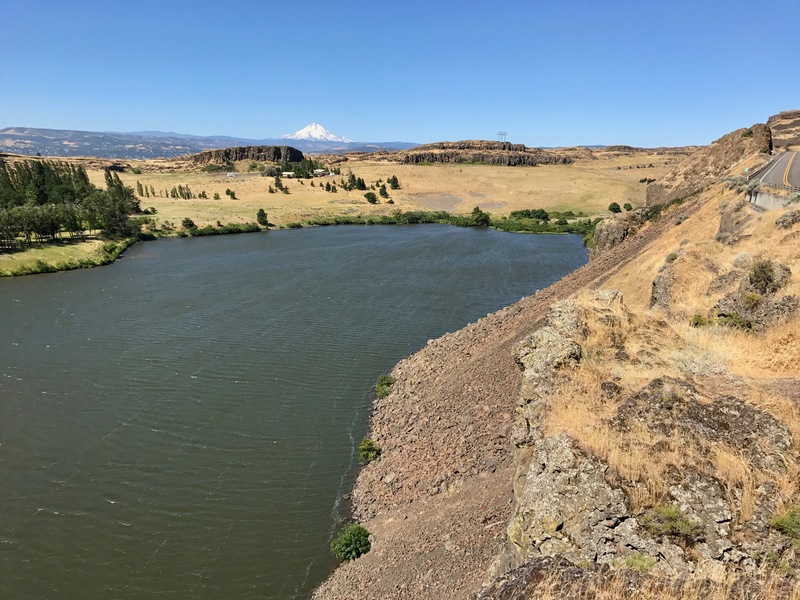 Along the route we could visit the Rock Fort Campsite which is a natural fortification located on the shore of the Columbia River, and where the Corps of Discovery set up camp on their journey home. 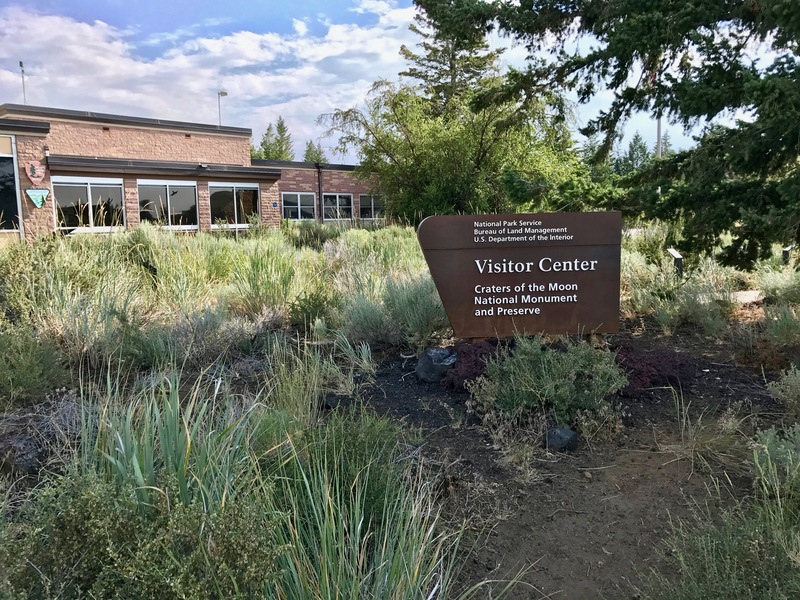 There is the Columbia Gorge Interpretive Center, the Sacajawea State Park Interpretive Center, and the Lewis and Clark Trail State Park. That evening we were at Hell’s Canyon Harley-Davidson for dinner. Unsolicited Comments About Portland Traffic: It was common practice to ask other H.O.G. members where they came from, how far they rode etc., and when we mentioned being from Portland, people were compelled to tell us about their bad experiences riding around in Portland/metro traffic. The H.O.G. HQ hotel for this event was the Jantzen Beach Red Lion and folks would drone on about the congestion, freeway crashes and the lengthy delays which were awful in the record Portland heat. About all I could say was “True that, and apologize for the apocalyptic congestion.” Then I’d add something about those new spiffy ODOT RealTime signs — you know, the big electronic signs that relay the obvious?! Day 3, — Took us to Great Falls, MT. There were multiple stops suggested to riders. The first was the Nez Perce National Historical Park. The New Perce were critical to the success of the Expedition by providing food and supplies. It was hot riding so, we left Lewiston early morning and as a result the park wasn’t open and we toured the exterior. Lewis and Clark actually split up at what is called today Travelers’ Rest State Park. Lewis went to the north. On the north route, you could see the Lewis and Clark Pass, Museum of the Plains Indian, and Camp Disappointment Clark went to the south, where you could see the Lost Trail Pass, Camp fortunate Overlook the three forks of the Missouri River at the Missouri Headwaters State Park, and the Gates of the Mountains. We were on Highway 12 headed over Lolo Pass for much of the morning. 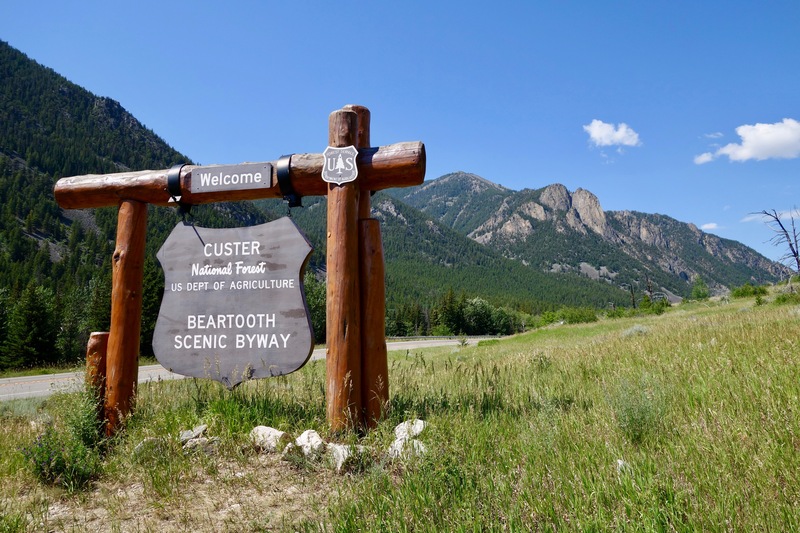 You’ve undoubtedly seen the photos of the sign that says “Curves next 99 miles…” Yeah, that one and it’s named one of the best motorcycle roads in the country with lots of sweeping curves and several tight ones. The elevation at the top is 5,233 feet in the northern Rocky Mountains and the temperatures were quite nice. Road conditions in some areas were a bit dicey and unfortunately a female member of the H.O.G. group veered up against the guardrail and crashed. She survived with a number of broken bones, but as I understand it, spent multiple days in the hospital. 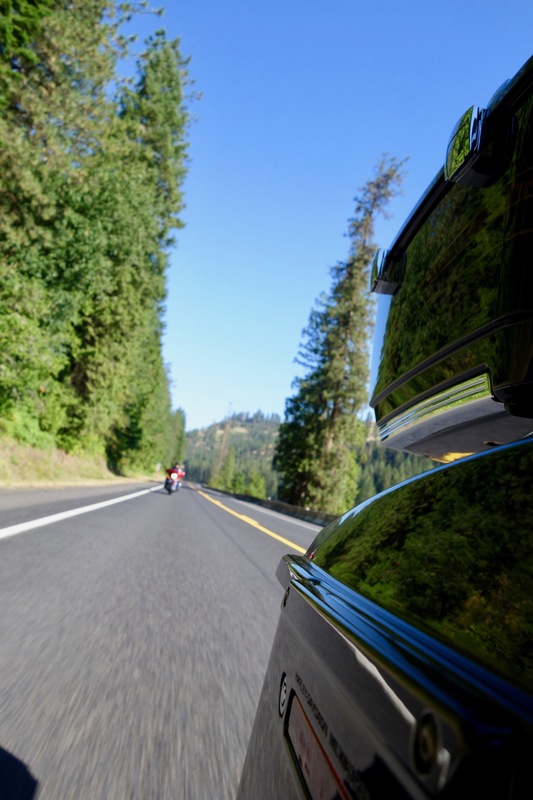 As we rode by the crash, her motorcycle freakishly went 75 yards up highway 12 and across both lanes of traffic and was sitting upright on the left side of the road, as if someone just parked it there on the kick stand. Very strange. That evening the group all got together for dinner at Big Sky Harley-Davidson. Day 4, — (Friday, July 14,) — Took us to Billings, MT where we spent a couple of days. There were a couple of stops planned. 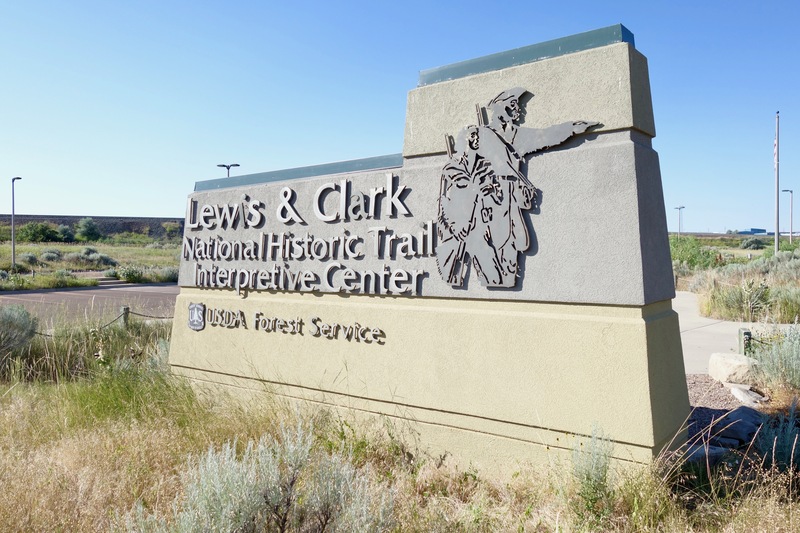 The first was the Lewis and Clark National Historic Trail Interpretive Center in Great Falls. We also made sure to take time to see the Great Falls of the Missouri including Rainbow Falls before leaving the area. Great Falls, MT is actually situated on the northern Lewis return route, and Billings, MT is on Clark’s southern route. 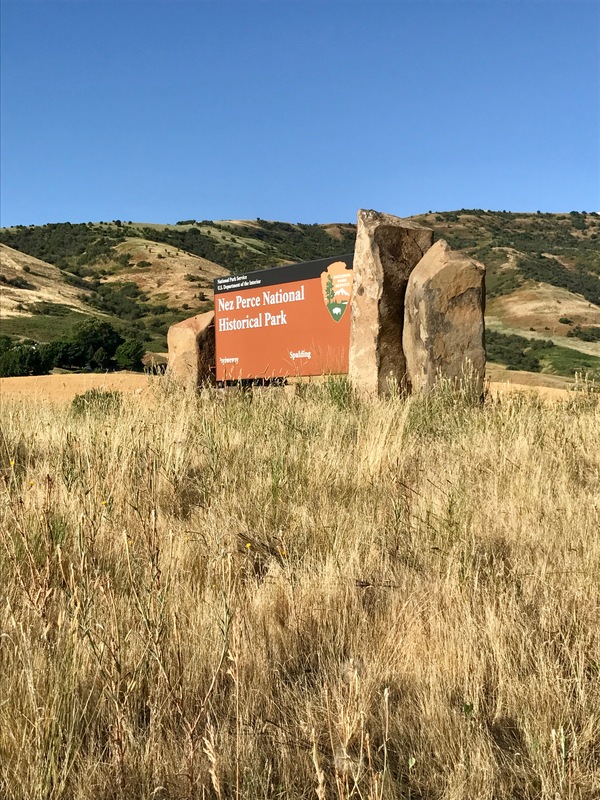 We took the more scenic route on Highway 89 south through the Helena-Lewis and Clark National Forest and then picked up Highway 12 east to Highway 3 south into Billings, MT. That evening we had dinner at Beartooth Harley-Davidson, but to be candid we were getting a bit tired of the pork sliders or burgers and salad. 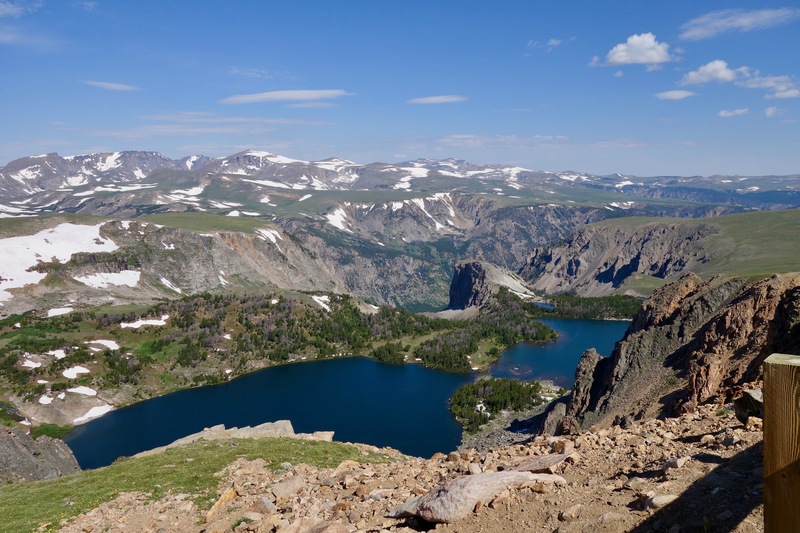 We decided to half that mileage and rode up Highway 212 to Red Lodge Montana and then over Beartooth Pass into Wyoming. 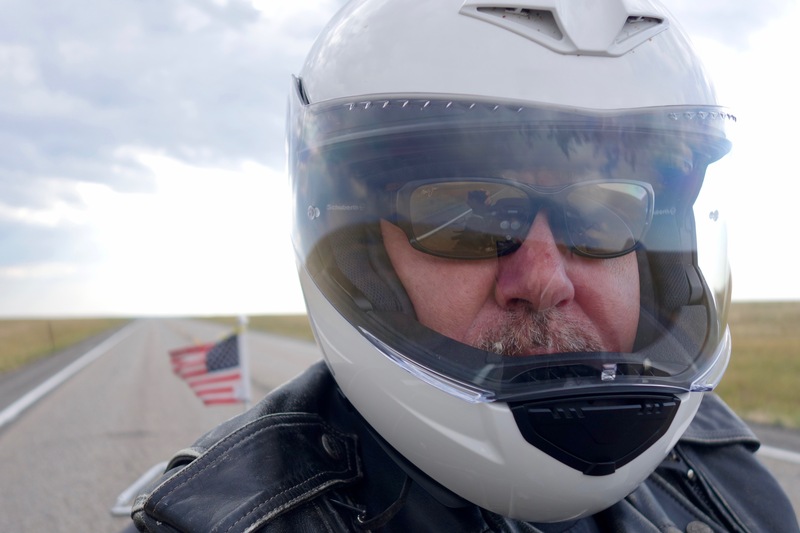 In Red Lodge, the annual Beartooth Rally was in full swing with a few thousand motorcyclists enjoying the area so, going over Beartooth Pass was slow riding, but we did enjoy the switchback curves. It’s a great ride with some incredible vistas, but not for the faint of heart. That evening we enjoyed a nice steak and ignored the gathering at Beartooth Harley-Davidson! 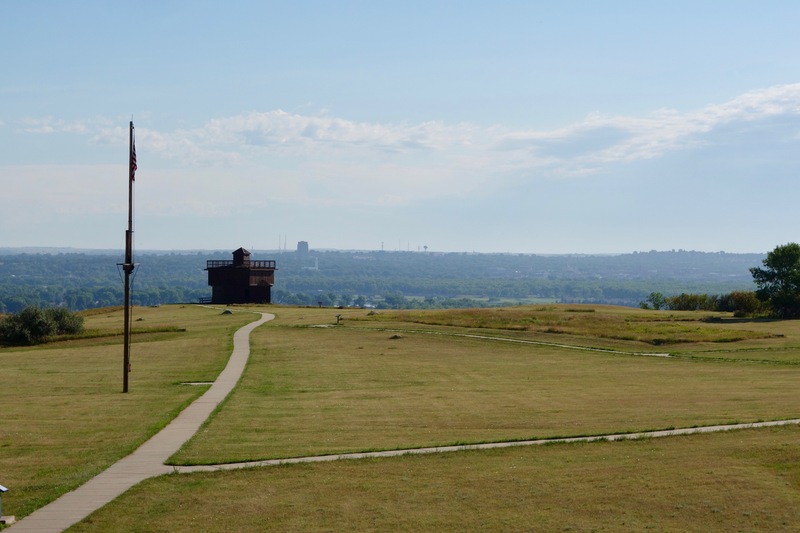 Day 6, — Had us traveling to Bismarck, ND., and it began early to avoid the sweltering heat. We’d been riding in heat advisory’s across Montana for a few days and now the humidity was increasing! One stop as we departed Billings was to tour Pompeys Pillar National Monument. Pompeys Pillar was named by Clark and he and other members of the Corps of Discovery chiseled their names into the rock itself. I believe this is the ONLY physical evidence that the Lewis and Clark Trail actually existed and took place. We rode on to Bismarck, ND. 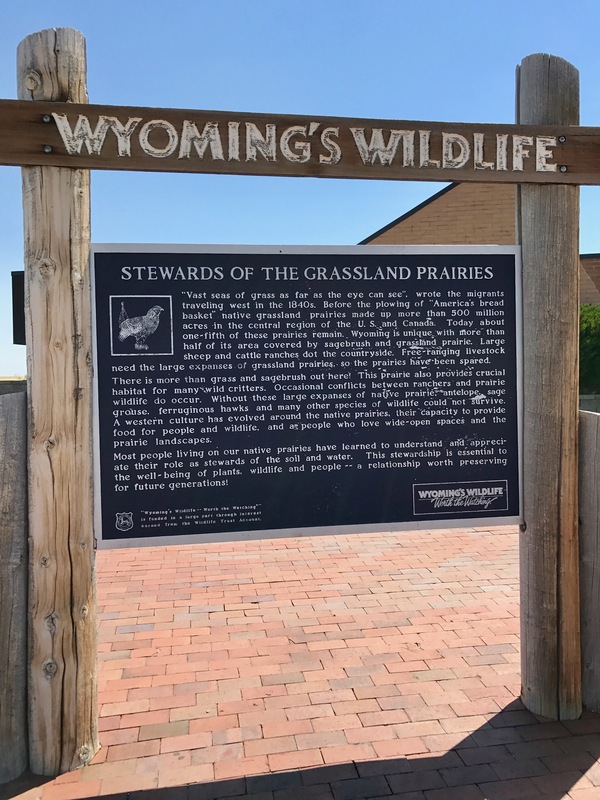 There were additional stops along the way that included the Missouri-Yellowstone Confluence Interpretive Center and Fort Mandan. I lived in Bismarck back in the day so, we ignored the extra miles and the point where Sacajawea and Toussaint Charbonneau joined the Corps. We enjoyed dinner at a local pub/restaurant while listening to some old Peter Frampton music on the jukebox! Day 7, — (Monday, July 17,) — The H.O.G. group headed west across the Missouri River from Bismarck and then we all rode south down Highway 1806 to Pierre, SD. 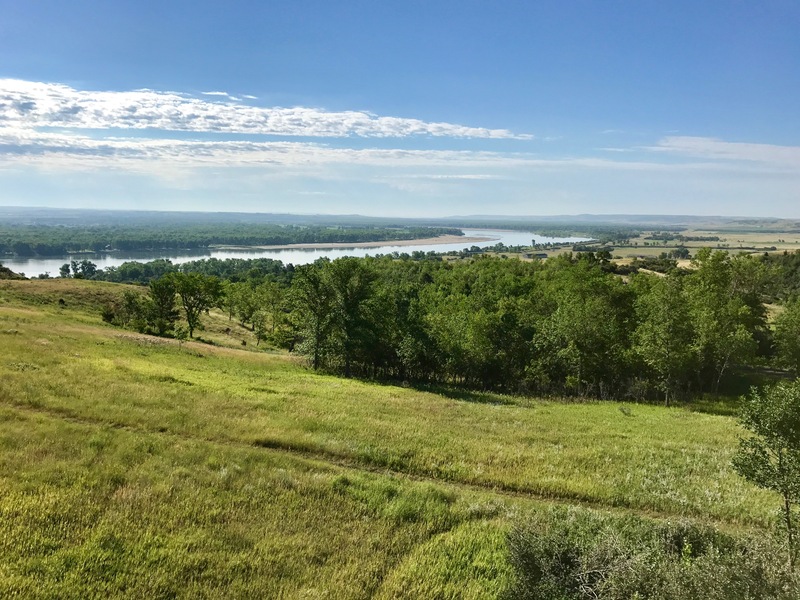 About 15 miles south of Bismarck we stopped at Fort Abraham Lincoln State Park & On-A-Slant Village and toured the area which provided a great example of Native American encampments Lewis and Clark would have encountered on their journey. We rode along Highway 1806 south down the Missouri River pretty much to the North Dakota – South Dakota border while watching out for farm equipment on the roads. From there, we had a couple of routes to follow into Pierre, SD., though most of the Missouri River between Bismarck and Pierre is covered by the Lake Oahe Reservoir and the road follows the east side of the lake all the way into Pierre. We had dinner at Peterson Motors Harley-Davidson in Pierre, but actually moved over to a city park on the river and tried Bison Burgers for the first time! Day 8, — (Tuesday, July 18,) — Due to other commitments we departed the Lewis and Clark H.O.G. group on this day and started our return trip back to Oregon. 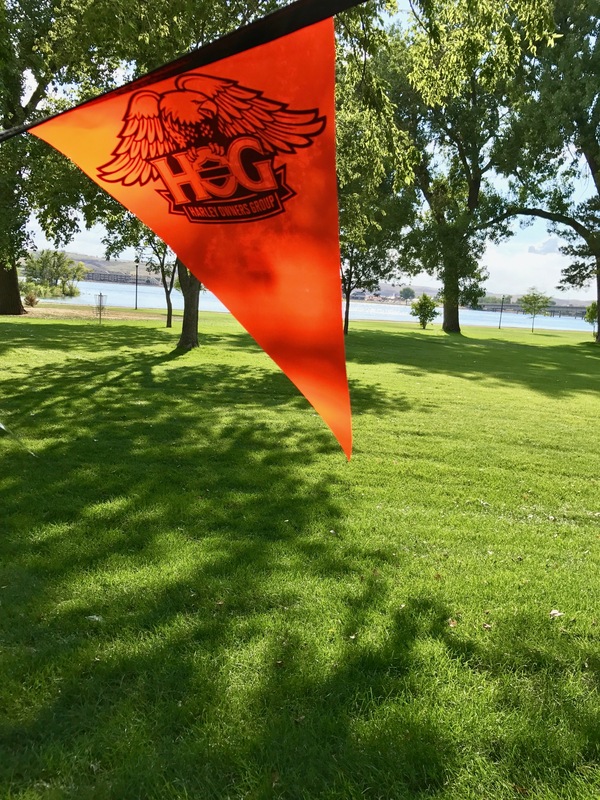 We intended to spend a couple of days in Boise, ID., to take in the Pacific Northwest H.O.G. rally and meet up with some other riders there. The next couple of days were about laying down some miles and we avoided the wandering of site seeing. We rode from Pierre, SD to Rapid City, SD on I-90, and skirted the Black Hills National Forest. 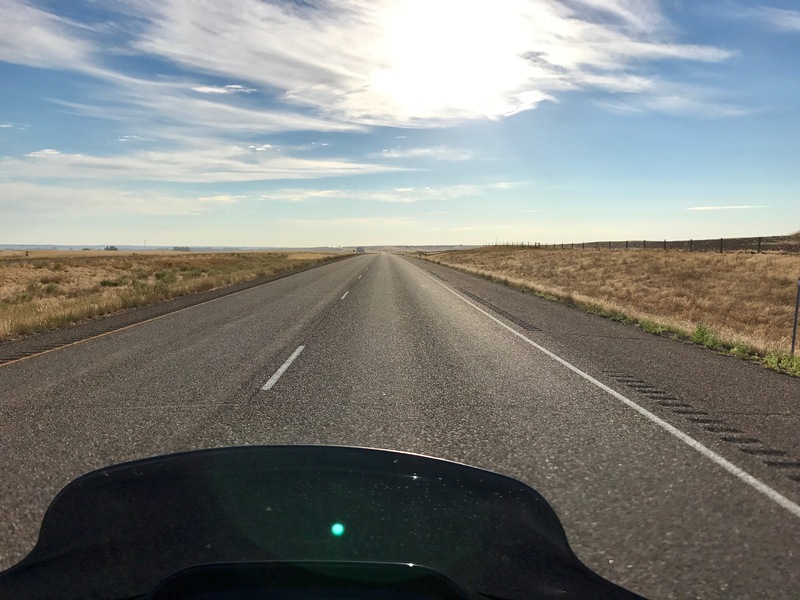 We traveled along Highway 18 and then took a wrong turn at Lingle, SD and ended up a few miles from the Nebraska border before having to backtrack, riding through Fort Laramie on Highway 26 and then on to I-25 and Casper, WY., where we overnighted. Day 9, — Had us traveling to Idaho Falls, ID., and we departed early to avoid the afternoon heat. 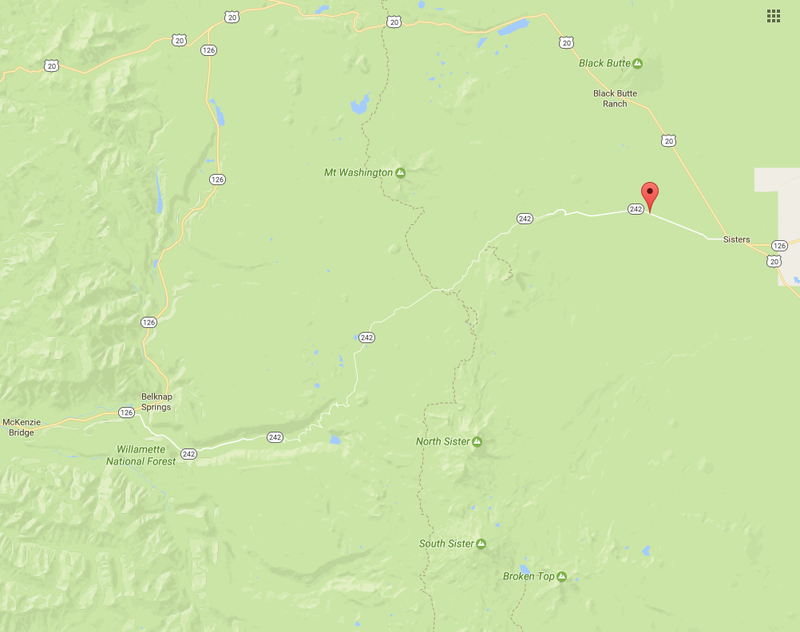 We were riding toward the Grand Teton National Park and Jackson when about 30 miles west of Dubois, WY, we encountered a fatal head-on car accident. We arrived at the scene at 12:30pm and the road had been closed since 9:30am. We had to endure a 3+ hour wait which put us behind and more importantly it put us riding in the hottest part of the day. The 50 miles from Jackson, WY to the border town of Alpine, WY was like walking a marathon with all the backed up traffic. We finally made it to Idaho Falls, ID on US26 by early evening. Day 10, — We continued our travel west to Boise, ID on the two-lane US 20/26. There are views of high desert, Atomic labs and of course Craters of the Moon Monument with it’s vast ocean of lava flows and scattered islands of cinder cones and sagebrush.We stopped for some site seeing, but didn’t explore any trails. We arrived in Boise, ID before 3pm and met up with some other riders who arrived from Portland. Day 13, — (Sunday, July 23,) — After a couple days of enjoying the local rides and taking in the city life along with parts of the Pacific Northwest H.O.G. 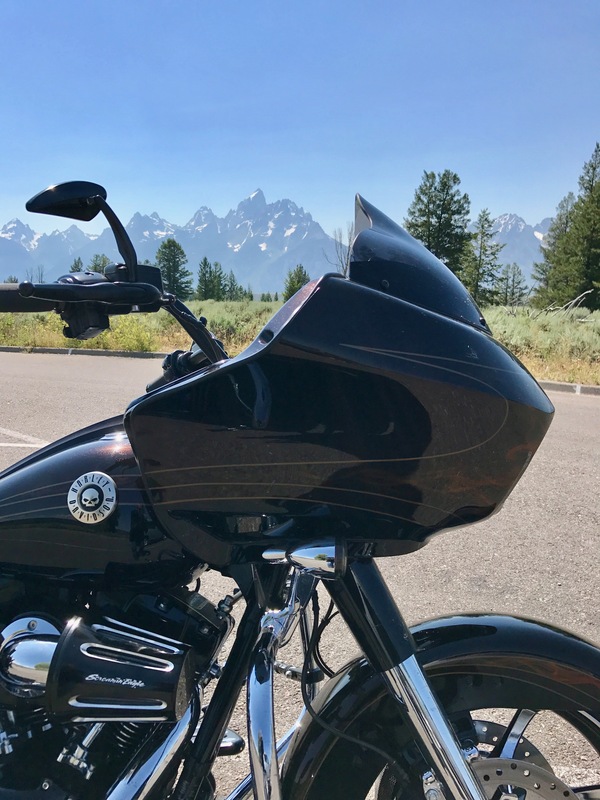 Rally (While at the rally in Meridian, ID., I had a chance to test ride a new 2017 CVO Street Glide with the new M-8 engine. I will do a post on that experience soon) we returned to Portland, OR via the most direct route on I-84. We finally arrived back in Portland that evening after touring over 3,500 miles with a number of new stories from the adventure in retracing the Lewis and Clark Expedition. In addition, we got to hang with a number of great H.O.G. members! 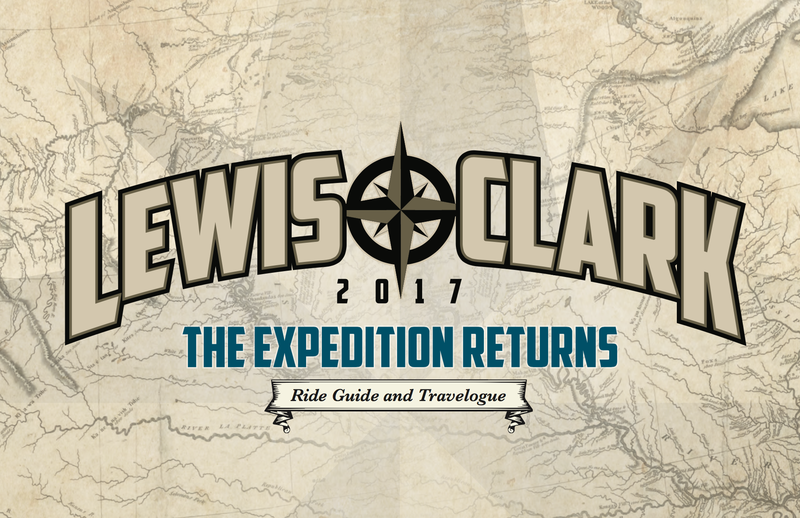 Updated August 15, 2017: Meriwether Lewis and William Clark left from St. Louis, Missouri with the Corps of Discovery and headed west in an effort to explore and document the new lands bought by the Louisiana Purchase. To read more about Lewis and Clark, visit the National Geographic site dedicated to their journey or read their report of the expedition, originally published in 1814. There are a number of period correct maps HERE. It could be the title of Harley-Davidson CEO, Matt Levatich’s memoir on his failed 2017 year while in charge of the Motor Company. * Harley-Davidson net income dropped 7.7%. Sales in the U.S. were down 9.3% and 6.7% worldwide. * Harley-Davidson now expects to ship 241,000 to 246,000 motorcycles to dealers worldwide in 2017, which is down approximately 6% to 8% from 2016. * Harley-Davidson expects to ship 39,000 to 44,000 motorcycles in Q3’17, which is down approximately 10% to 20% from 2016. * Approx 180 U.S. based manufacturing jobs will be cut in Menomonee Falls and Kansas City. This in addition to the 118 workers who were axed back in April this year at the York plant as some positions were being shifted to Kansas City. I’m being a bit snarky here, but his statement appears either woefully naïve to the point of negligence or a continuance of marketing spin. Proclaiming an unprecedented future result of this magnitude smells like stunningly wishful thinking at best or at worst plain lying. For reasons I can’t explain, why would Mr. Levatich climb up on a high-wire without a net given such an overly-optimistic prediction? Even with nearly 8-million Americans that are “sleeping license holders,” — those who have motorcycle riding credentials, but don’t own a bike — it doesn’t pencil and seems unobtainable. I don’t know if the boardroom folks in Milwaukee read the NW Harley Blog on a regular basis and/or hang on its every word. But, we know the motor company has been continuously producing motorcycles for more than a century, yet seemingly everyone on the internet with a keyboard thinks they can do it better. And it’s a well-established fact that internet bloggers and commenters are geniuses. They definitely know how to run a business better than a company that has been constantly producing motorcycles through two world wars, the Great Depression, and roughly 20 U.S. recessions. Sure the motor company needs our help and I’ve got some feedback and plenty of comments. 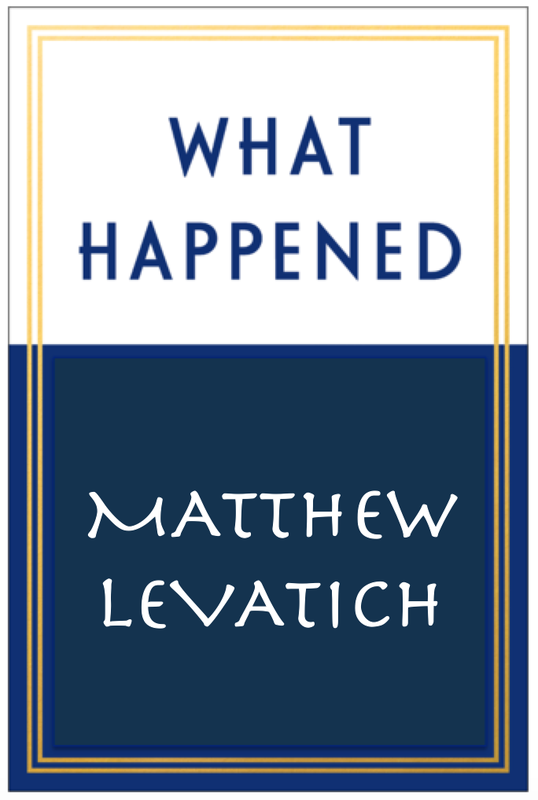 But, until the motor company calls me asking for it, I’ll look for Mr. Levatich’s memoir, which will certainly be “a deeply intimate account and a cautionary tale on the world’s most iconic motorcycle brand. Slightly modified book cover courtesy of Simon & Schuster. The Old McKenzie Pass Highway (OR 242) will officially open to all traffic on Monday, June 19, 2017. The narrow, twisting roadway and high elevation (5,325 feet) make the highway too difficult to maintain and keep clear during the winter months. Many of us look forward to the annual opening and to traverse lava fields, snowcapped peaks and cruise along rushing rivers which highlight this scenic highway to central Oregon’s Cascade Mountain passes. Heading east-bound, OR 242 travels through Lane, Linn, and Deschutes counties, beginning at the junction with OR 126 near McKenzie Bridge and ending at the junction with US Highway 20 and OR 126 at the City of Sisters. From Sisters, Oregon heading west, the route travels past hay meadows and ascends 2,000 feet through ponderosa pine forests. The road follows an old wagon route, emerging from the forest at Windy Point and provides a dramatic view of Mt. Washington and a 2,000-year-old lava flow. The 25 mile, 4,000 foot descent snakes down switchbacks to the dense Cascadian forests and ends near the McKenzie River. Few realize that the McKenzie Pass is also known as the Craig’s McKenzie Salt Springs/Deschutes Wagon Road. The backstory — in 1862, John Craig was was one of 50 men hired by Captain Felix Scott to build a trail from Eugene over the Cascades. By then the rush of westward-bound Oregon Trail pioneers had slowed, but the discovery of gold in Eastern Oregon prompted a flood of people heading eastward. Scott’s plan was to sell Willamette cattle to the hungry miners east of the Cascades. As Scott’s road-building crew neared the lowest route across the mountains they encountered miles of snow and jagged lava fields at McKenzie Pass. Craig favored chipping out a road through the lava fields, but Scott decided to skirt the lava fields in favor of a notch at Scott’s Pass on the shoulder of North Sister that was 1000 foot higher, steeper and crossed more snow. Scott’s route was later abandoned and is known today as the Scott Trail in the Three Sisters Wilderness. After working for Scott, Craig spent the next 15 years working for himself while championing his vision of a lower crossing through McKenzie Pass. In 1871 he formed the McKenzie, Salt Springs and Deschutes Wagon Road Company and began to build his toll road. He cut trees, chipped and chiseled a roadbed out of the jagged lava fields just north of North Sister to form a McKenzie Pass crossing lower than what was available at the time. By the Fall of 1872 his road open and began collecting tolls of $2 for a wagon, $1 for a horseback rider, 10¢ for cattle and 5¢ for sheep. After its completion he won a federal contract to deliver mail from the Willamette Valley to Camp Polk in Central Oregon over the road. In summer, the mail was carried on horseback. In winter it was carried on John Craig’s back. To accommodate the mail carrier, a small cabin was built about half way across, in which he could spend the night. For many years John Craig carried mail from the Willamette Valley to Eastern Oregon, by horseback in the summer and on his own back in the winter. After attempting to ski Christmas mail over McKenzie Pass in the winter of 1877, he was found frozen beside his mail pouch in his shack atop McKenzie Pass. Mystery still shrouds the details of his death. The U.S. Forest Service decided in 1920 to make the highway a tourist-friendly route over the mountains, so engineers took care to align it for sightseeing, with spectacular views of volcanic peaks, including the Three Sisters, Three Fingered Jack, Mount Washington, Broken Top and even the more distant Mount Jefferson to the north. The road became a seasonal scenic highway in 1962 with the completion of the Clear Lake-Belknap Springs section of OR 126. The highway is a local favorite and should be on everyone’s Oregon highway bucket list. OR 242 map/photo courtesy of Google.